Soooo, ya know, I've heard a lot of things about how wheat is not good for our bellies etc etc. And I get it. I could see where that might make sense. BUT...I just....I cannot live my life without carbs. Do you have ANY idea how much of my diet is carbs?! WAY TOO MUCH! I know it but I can't help it! I need breads and pastas and potatoes! Neeeed em! *cough* but um anyway...maybe sometimes it's nice to cut back. But ya know...with cookies. I'm not sure if you know this. I've been super tight lipped about it and am definitely not uncontrollably talking and thinking and planning about this all the time* but...I'm getting married. And I'd like to be in decent shape for that big day. Um...but I still wanna eat cookies. So, what all this lead up is well...leading...to is THIS: cookies. 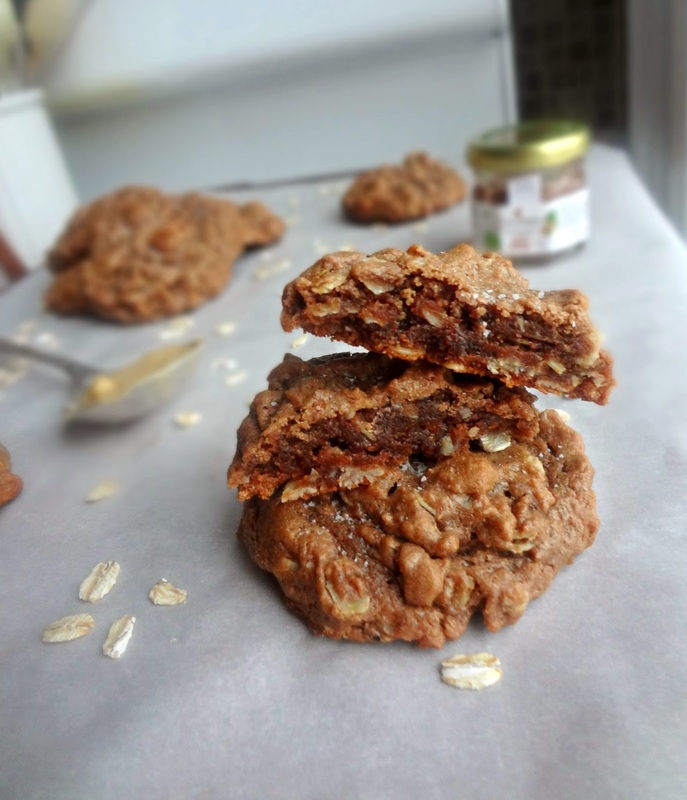 Cookies made with oats instead of flour. Cookies with a surprisingly small amount of sugar. 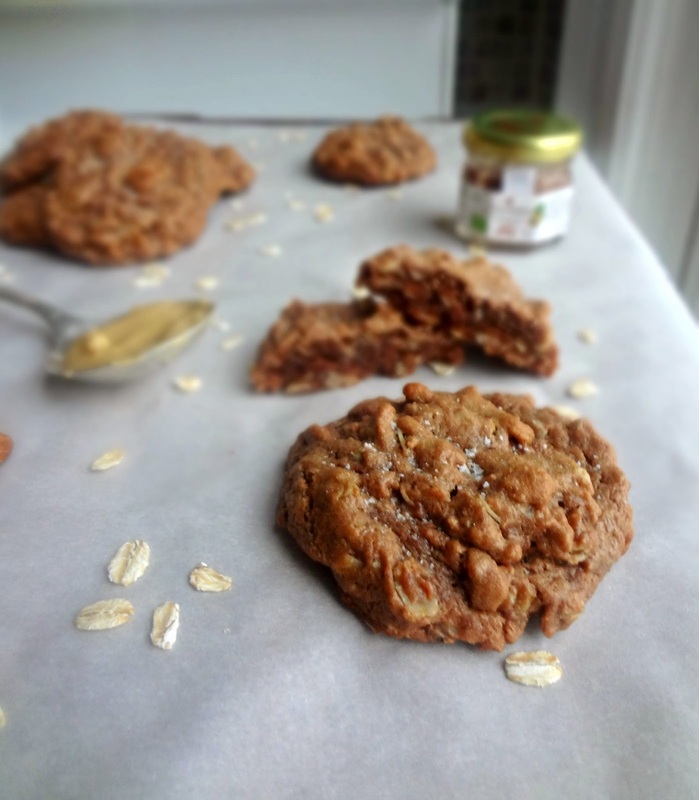 Cookies where the only fat is in the forms of peanut butter (I used homemade, so-healthy!) and nutella (you can probably use homemade, but this time around I used the safer for baking yet still healthier option of Nocciolata Organic Hazelnut Spread ). 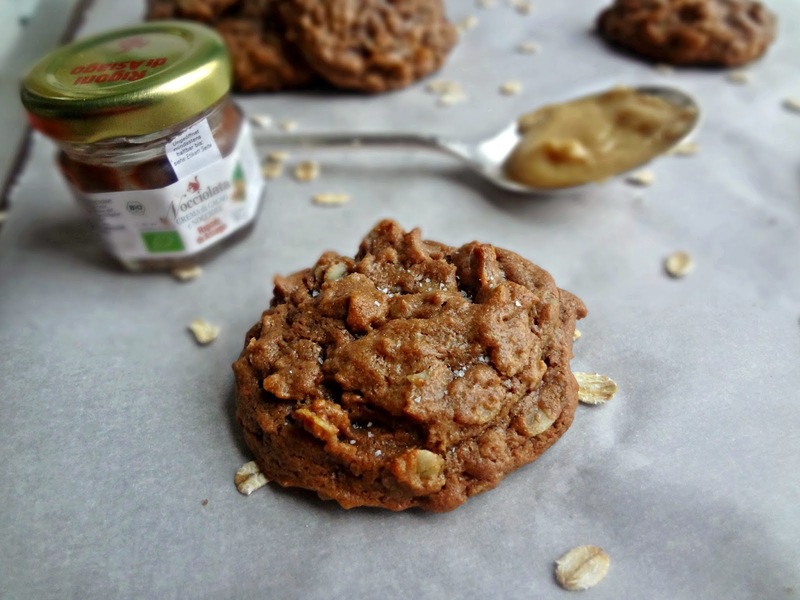 Cookies that actually taste a lot like those no-bake cookies that I LOVED as a kid. 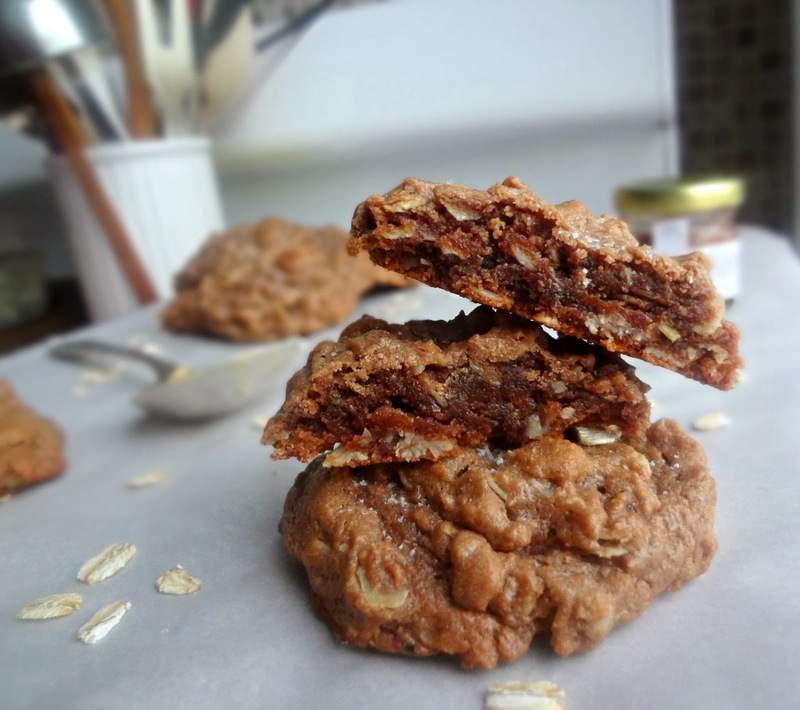 Cookies that are chewy and delicious and satisfying. So um...when am I coming over? I presume you're making these for me. Preheat oven to 350 degrees. Prepare a large baking sheet (with non stick cooking spray, parchment paper, or silpat ). In a medium bowl mix together the egg, brown sugar, milk, peanut butter, and nutella until smooth. Stir in oats, baking soda, and salt. Drop heaping tablespoons onto prepared pan and bake 8-10 minutes, until set. Remove from oven and sprinkle with salt as desired. Cool on sheet 10-15 minutes, then move to a cooling rack. Disclaimer: This post contains Affiliate links. I was provided with samples of Nocciolata spread by Rigoni di Asiago to try, and I was under no obligation to review or write a positive review, if I so chose. All opinions are, as always, my own.